items of interest. Be sure to watch for our eBay sales. Why not add us to your bookmarks? Pastime Projects – makers of radio amateur kits – in Central Ohio would like to recommend to our friends and customers that you visit the Findlay Ohio 2018 Hamfest. It will be held September 9, 2018 at the Hancock County Fairgrounds in Findlay Ohio. part of the kit build ourselves. (Our ten year old secret)! Have fun! 73 Glenn for Pastime Projects. I recently saw where a new ham operator was questioning how one tunes a HF transmitter that does not have a built in meter in the output circuit. He was referring to the Pastime Projects 6V6 transmitter kits but the question would apply to similar low to medium power transmitters. One easy and cheap way is to use a CB Field strength /SWR/power meter. If you check the specifications, you will find these meters will work just fine on all HF frequencies from 160 to 10 meters and beyond. Many are listed at safe power ratings of 10 to 1000 watts of output power. And, they sell for $30.00 or less (much less) on eBay! Ideal for experimenting and measuring our HF transmitter kits performance with almost lab rating results for low surplus prices. Simplest way to use the meter is as a field strength meter. The meter will have a hole for a short wire antenna to attach. (Make sure the wire antenna you use has some kind of top on it to prevent injury to an eye!) With the meter near your transmitter – but not electrically attached – try transmitting into an antenna and tune your FSM for maximum strength. The meter follows the strength of the transmitter, so tuning for maximum should get you great results. Good luck! Always get help from your local club when you can. A good experienced radio amateur is always a friend to have. 73 Glenn .. for Pastime Projects. In the October 2017 QST Magazine Tom Gallagher NY2RF , ARRL Chief Executive Officer, wrote a commentary about new hams (radio amateurs). He noted that of the thousands of newly licensed hams each year, nearly half never get on the air. Please take time to open your October 2017 QST to page 9 and read Tom’s editorial “Second Century – A learning Moment”. This is a call to arms for us more experienced hams to remember our elmers (Mentors) who showed us the way. We need to take the time and effort to get back to basics and help the new hams get on the air. ARRL is doing its share but this needs some one-on-one training as well. 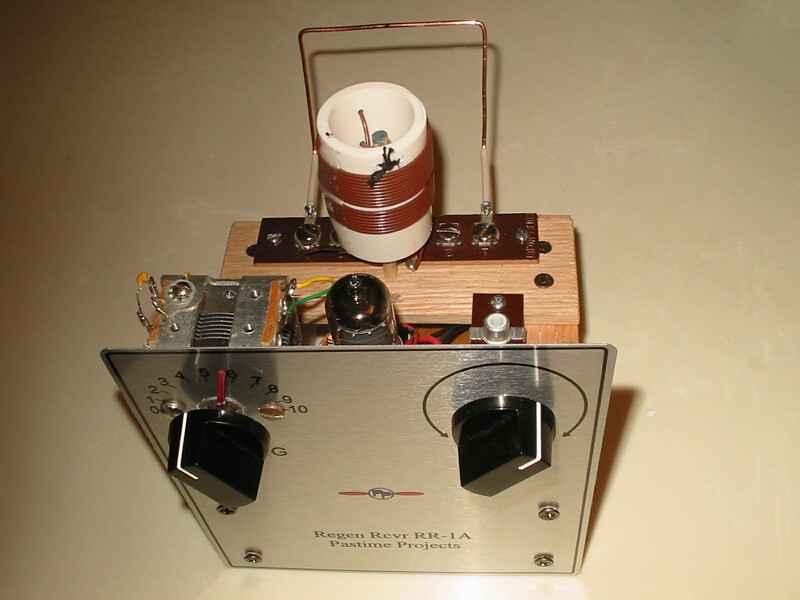 Pastime Projects (www.pastimeprojects.com) has manufactured radio amateur projects from the 1940 and later eras. (Grandpa’s radios). We are proposing to write do-it-yourself articles for new hams. Our format tends to be very fundamental, without too much engineering data. The hows, not the whys. What media would best suit our articles? Would a PDF file emailed to you be worthwhile? Read through our past POSTS and see if this format would work for you. Pastime Projects has a new regenerative receiver kit. Our biggest concern is its a little complicated. We are considering offering it as a multi step mailing in increments so that the builder tackles one assembly step at a time. Good idea? Let me know. W8JZI Glenn Brown, owner, Pastime Projects. pastimeprojects (at) yahoo (dot) com. From time to time http://www.pastimeprojects.com adds items to the “special sales” page. item and see it work. Please let us know if you are interested. ‘Slat Board’ novice transmitter for 80 and 40 meter CW. 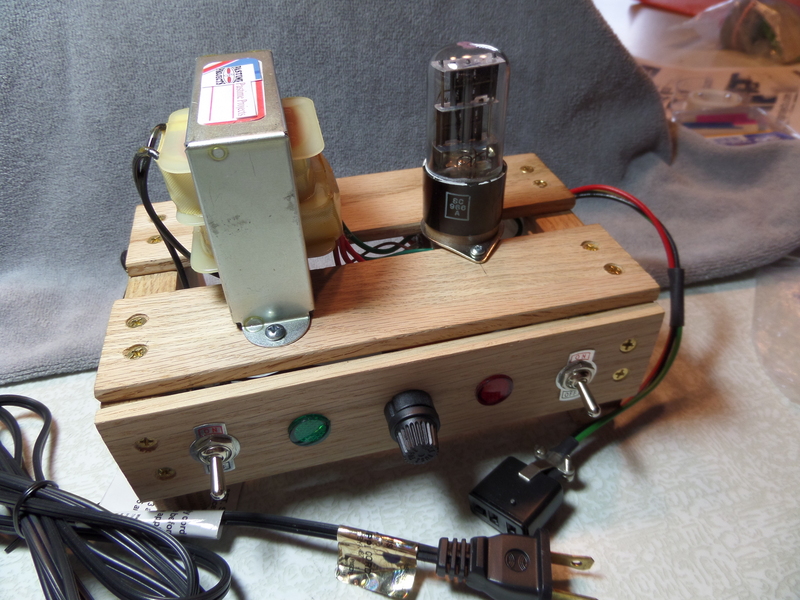 This model uses a vacuum tube as a rectifier instead of the solid state diodes used in the other power supply available. Either model has been tested and performs very well. Full specifications will be available on the web page. Or contact pastimeprojects(at)yahoo(dot)com for more info. Thanks to the suggestion of one of our overseas amateur radio builders, this kit has been packaged as a 40 meter Special Edition. The trend of 40 meter operation using low power cw is growing in popularity. This kit includes the three coils, plate, antenna link, and cathode coil, pre wound and packaged with the kit. In exchange for the labor and cost to include these prefinished coils, the common 8 penny nails used for coil winding have been excluded from the kit. Also, the extra wire for winding the 80 meter coils is not included. The coil winding form layout and winding information are, of course, still part of the provided manual. Our design includes Amish prepared oak strips and end pieces, brass screws, “sucker sticks”, and other hardware just like the original. Many of the components are new (and we think more reliable than originals) but the retro look remains. This kit will operate on 40 meter or 80 meter CW ham radio frequencies with power out in the 2 to 5 watt (or more) range. It is crystal controlled. Change from one band to the other requires different coils be soldered in. The 40 meter version seems most popular among our builders.. The manual that comes with this kit contains step by step instructions for assembly, wiring, and soldering. The vacuum tube is included. The builder will need a crystal and power supply. To put this kit on the air a license, antenna, and power supply will be required. The builder should be familiar with working around high voltage before applying power to this kit.